$60 billion is a lot of money. Think about it. For example, insured losses from global disaster events were around $49 billion in 2016, according to Swiss Re. That’s a large number too, but not as large as the $59.9 billion cost to U.S. employers of the most serious workplace injuries and accidents in 2014, per the just-released 2017 Liberty Mutual Insurance Workplace Safety Index. By the way, the most serious ones are injuries that cause employees to miss six or more days of work. The nearly $60 billion in direct workers compensation costs to U.S. businesses translates into more than $1 billion a week that companies spend on these injuries, the index suggests. As big as it sounds, the total cost actually fell from $61.9 billion in 2016, according to Liberty Mutual. 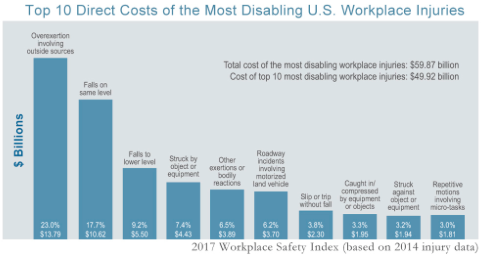 The 10 leading causes of the most disabling work-related injuries account for $49.9 billion, or 83.4 percent of the total cost of $59.9 billion. Developed annually by the Liberty Mutual Research Institute for Safety, the index is based on information from Liberty Mutual Insurance, the U.S. Bureau of Labor Statistics (BLS) and the National Academy of Social Insurance. The index helps employers, risk managers and safety practitioners make workplaces safer by identifying critical risk areas so that businesses can better allocate safety resources. Here are some useful additional facts and statistics on workers compensation from the Insurance Information Institute.